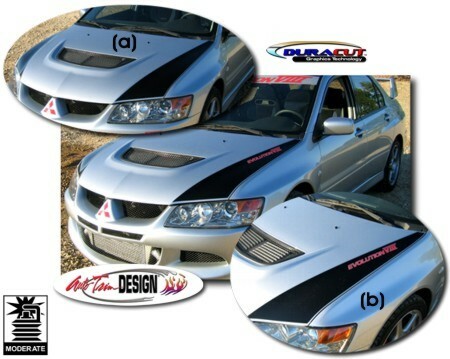 Highlight and enhance your Mitsubishi Evolution VIII or IX's hood with these awesome looking graphics. Uniquely designed to fit at each side of the hood's center, these Hood Graphics can be provided with or without the "Evolution VIII or IX" badging as shown. Available in a wide variety of colors. Each graphic is pre-cut and ready for install - No Trimming Required! Set is packaged with one (1) Driver Side and one (1) Passenger side graphic.